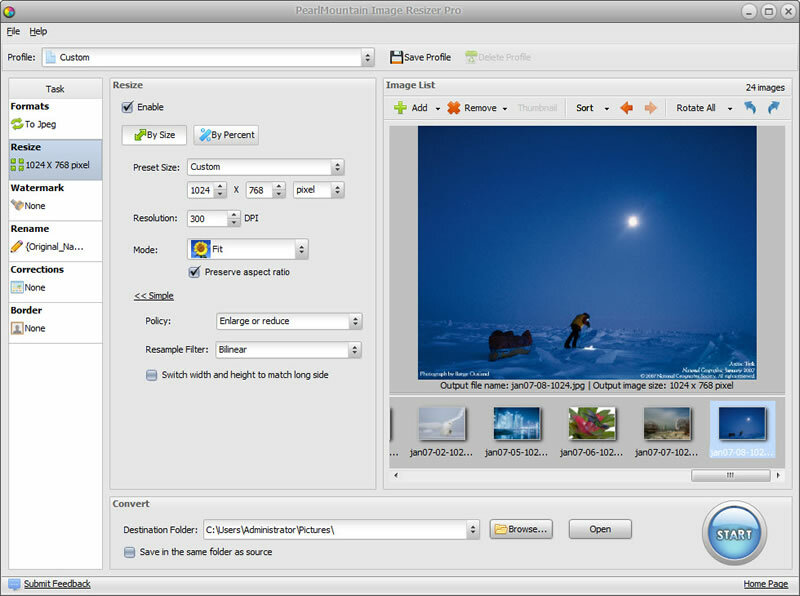 PearlMountain Image Resizer Pro allows you to resize, convert, add watermark to hundreds of images in batch mode. It supports the most popular image formats: JPEG, BMP, TIFF, PNG, PSD, GIF, TGA, RAW, and almost all image formats. It's a fast and easy-to-use image conversion tool for both amateur and professional photographers to deal with digital photos, with one click your digial photos will be just right for the Web, blog, e-mail..etc. PearlMountain Image Resizer Pro allows you to resize, convert, add watermark to hundreds of images in batch mode. It supports the most popular image formats: JPEG, BMP, TIFF, PNG, PSD, GIF, TGA, RAW, and almost all image formats. It's a fast and easy-to-use image conversion tool for both amateur and professional photographers to deal with digital photos, with one click your digial photos will be just right for the Web, blog, e-mail, photo printing, Facebook, MySpace, mobile phone.